Getting there: regular flights from major capital cities to Sao Paulo, Rio de Janeiro, and Brasilia. The largest country on the South American continent, and the fifth largest country in the world, many other nations are hard-pressed to compete with Brazil for superlatives as a travel destination. Of course, for pure razzle dazzle thwew ia the allure of Rio de Janeiro and world famous Brazilian beaches. But don't miss the bustling rhythm of the largest metropolis in Brazil, Sao Paulo. With kids in tow, Sao Paulo can be one big family adventure with trips to the botanical gardens, (Jardim Botánico) or the serpentine Butantan Institute -- including a visit to the snake pit, where visitors learn how snake venom is turned into antidotes for snake or spider bites! Also while in Sao Paulo, don't miss Ibirapuera Park, which ranks as one of the world's best urban oases, featuring stops at the aquarium, the planetarium, and opportunities for lovely meandering strolls. For nature-in-the-wild the Amazon rainforest - which covers more than half of the country - provides world class adventure and excitement as a top ecotourism destination. • Brasília - The capital city is wonder to behold for lovers of architecture and urban planning, including the wild and modern Brasilia cathedral (with 1 million visitors a year, the top attraction). the Itamaraty Palace ('the palace of the arches") and the sprawling Three Powers Square. • Florianopolis - A veritable Disneyland of natural beauty, Florianopolis is home to some 40 popular beaches, and becoming a major summer vacation destination for the international jet set as well as neighboring Argentines next door. • Manaus - An urban city plunked down in the middle of the jungle, Manaus is the place to launch your exploration of the Brazilian Amazon (most major tour operators are situated here). Manaus is also the gateway to the Anavilhanas archipelago and Jaú National Park. • Porto Alegre - The biggest urban hub in southern Brazil, Porto Alegre is the capital of the state of Rio Grande do Sul, land of the Gauchos, and a major gateway to Brazil's incredibly scenic green canyons, the "Grand Canyon of Brazil". • Recife - The major city in the Northeast, Recife is known as "The Brazilian Venice" which is built on several islands linked by more than 50 bridges. In Recife's backyard is also located Porto de Galinhas often named THE best beach in all of Brazil. • Salvador - The capital of the state of Bahia is home to a picturesque colonial town, but the main attraction here are the beautiful beaches ranging from secluded inlets to wild surfer action. Meanwhile, spectacular tours through Brazil's national parks include camera-ready photo ops at such world famous landmarks such as Iguacu Falls. Or explore the planet's biggest concentration of fauna -- found at the world famous Panatal, a natural wetland 20 times the size of the Everglades in Florida -- complete with jaguar, crocodiles, parrots, and dozens of varieties of water birds. • Brazil is BIG, How big? It shares a border with every South American country except Chile and Ecuador. • Praia do Cassino (Portuguese for Casino Beach) is Brazil's most southernmost beach and one of the longest uninterrupted sandy seashores in the world. 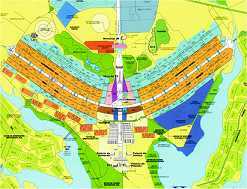 • From the sky central Brasilia is shaped like an airplane. The capital city was planned and developed in 1956 and became the capital in 1960. • The Brazilian national dish is feijoada, a black bean stew with dried, salted, and smoked meat. Brazil Tourism - The official site offers an extensive look at the country's history & culture, suggested itineraries for nature trips and outdoor adventure, searchable database to hotels leading to a link list and contact details, travel fun facts and a glossary of popular Portuguese phrases. Brazil travel guide - Wikitravel - Here's a great guide to the country with hyperlinks to major cities and attractions, insider tips on where to go and what to do, list of annual holidays and events, plus transportation guides by plane, train or bus, health & safety tips, maps & photos.